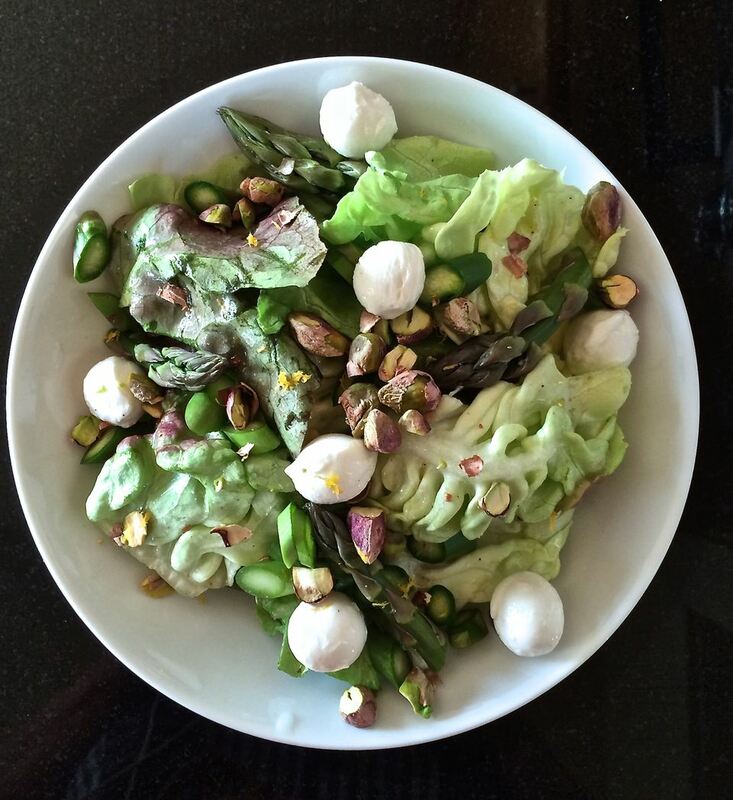 This salad is wonderfully simple: raw asparagus and butter lettuce are tossed with a lemony vinaigrette and topped with mozzarella and pistachios in this very green, springy salad. The final flavor (and textures) far surpass the marginal effort it requires to put together. The thinly sliced asparagus has a clean, fresh flavor that will be most delightful to those who've only had this spring vegetable cooked. So, yes, indeed you can eat (and should!) asparagus raw. Trim the asparagus. Either snap off the ends or peel the spears (see below for specifics). Cut the trimmed spears on the diagonal into thin slices (you want them long and skinny) and set them aside. Break off and discard the tough exterior lettuce leaves. Tear the remaining leaves into bite-size pieces, rinse them clean, and pat them dry with paper towels or spin them in a salad spinner. Set them aside. Scrub the lemon clean. Finely grate off about 1/2 teaspoon of zest from the lemon into a large salad bowl. Cut the lemon in half and juice it; add 1 tablespoon of the juice to the bowl with the zest. Peel and mince the garlic; add it to the bowl. Whisk in the olive oil, salt, pepper, and mustard (to the lemon zest, juice, and garlic) to make the dressing. Add the asparagus and toss to coat the slices with the dressing. Add the lettuce and gently toss to coat thoroughly. Divide the salad evenly among 6 salad plates. Sprinkle each serving with pistachios and perlini, as well as the fresh chervil leaves, if you're using them. Serve immediately. To Snap Asparagus: Hold a spear of asparagus at its tip and at its base, bend the spear until it snaps—it will magically snap at about that point where it goes from lovely and tender to tough and woody. To Peel Asparagus: Trim off and discard any browned or dried out stem ends, then use a vegetable peeler to peel each spear at about the halfway point, leaving the peel on at the top and removing it from the bottom. This takes more time than the snapping method, but leaves you with more edible asparagus.